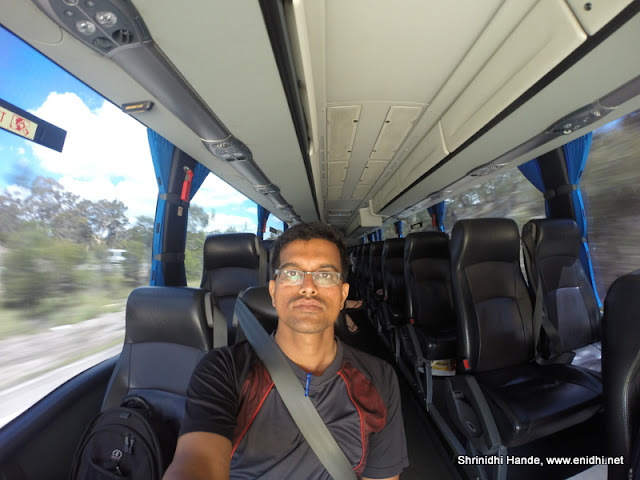 I took a Grayhound bus from Canberra to Sydney- The 300km journey lasted for about 4 hours, because the max speed allowed on the highway is 110 kmph. During this day time journey, I got to witness the Australian country side and the clouds- perfect excuse for skywatch friday. This post shares some clicks from the journey, of the sky above, road below and the vehicles in between. Pictures of the sky above during my Canberra-Sydney bus journey! Above: Sitting a level above driver's seat, I had the best view. More skywatch pictures here on Skyley . More Australia posts here. Beautiful photos. It looks like you got the bus ride all to yourself! Sadly where I live they are cutting Greyhound bus services on routes due to lower ridership. Australia is beautiful. I've enjoyed travelling there but didn't get to this part of the continent. @Joyful- which part of Australia do you live in? My Self Suresh , Works for www.youpack.com.au as a web guy! you should start a trip from Melbourne to Adelaide that will be good tooo.